Etihad had a little leverage, with 71 Dreamliners on order (41 B787-9s and 30 -10s). A little further convincing came when the airline showed Boeing some proposals for its A380 interiors and suggested a little flexibility in the catalog approach was required to make the B787s of a comparable standard, as well as a great advert for the Dreamliner. A five-year research, design and implementation project followed, conducted by the airline and the Etihad Design Consortium (EDC), comprising Honour Branding, Acumen Design Associates and Factorydesign. 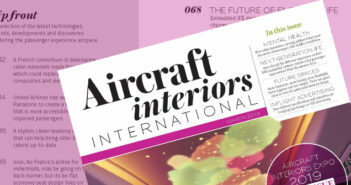 The result of this work you see on these pages and in the A380, with the lighting, trim and finish inspired by contemporary modern Arabian design and the colors of the desert, complementing the new ‘Facets of Abu Dhabi’ design identity. From the moment first class passengers enter Door 1, the level of innovation in this aircraft is clear. Clearly the level of ‘wow’ factor achieved in the A380 entrance areas isn’t possible within the smaller Door 1 area of the B787, but by altering the layout of the galley monuments to create a cross aisle at the front of the first class cabin, starboard guests don’t have to walk through the galley area to access their aisle. By the simple act of turning right, directly into the first class cabin, the appropriate tone is set for the journey. 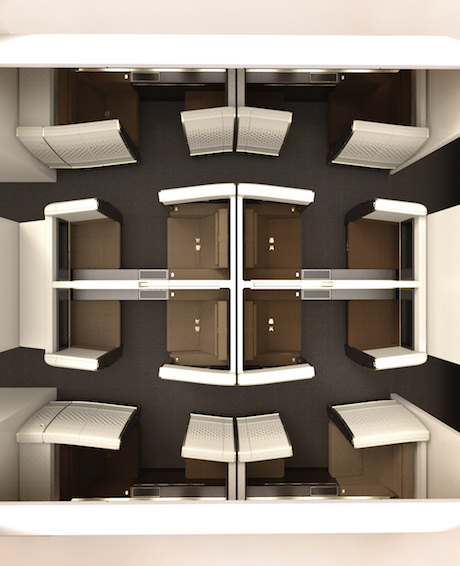 Perhaps the most significant example of Etihad pushing the design envelope is the ceiling in first class. To create a luxurious and spacious environment, Etihad did not want any overhead bins. Some airlines have opted not to have central bins, but not having outboard bins was not a Boeing option – at the time. 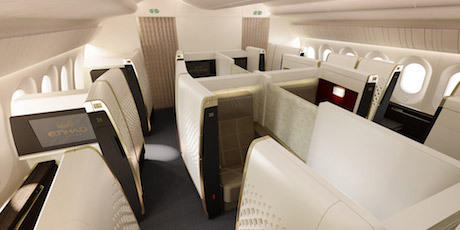 Following a week-long workshop in Seattle with Boeing, Teague and other stakeholders, a feature known as the Premium Ceiling was created – a clean and elegant design that makes the cabin feel extra spacious. Boeing was prepared to undertake the project on the agreement that it was subsequently offerable to future customers. Of course stowage space is lost, but with only eight seats, and room under the ottomans to stow carry-on bags, stowage is not a problem. If more space is required, there are also large stowages at the front of the cabin. Boeing managed to incorporate all the existing ventilation systems into the new ceiling, but there were a few challenges with the lighting systems. One problem was that part of the system is designed to shine light across the cabin, which is distributed further by bouncing off the bins. Without those bins, shadows were created, so extra care had to be taken in adjusting the scenarios for the decorative sconce lighting to make sure that shadows did not appear where they are not wanted. A further challenge was how to make the eight First Suites on the B787 a comparable premium experience to those on the much larger A380. The suites may be smaller, but they are truly luxurious; indeed this is the most luxurious experience to be found on a B787. The team achieved a 26in-wide seat and an 80.5in rectangular bed by devising a forward/aft-facing LOPA, which maximizes the width of the suites at the shoulder area where the space is really appreciated, while the foot end tapers. That flaring and tapering, combined with the 56in-high suite walls, gives a distinctive curved shape to the aisle. 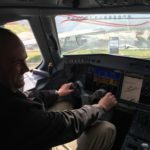 Of course, Boeing had to conduct a study of the design to ensure there were no issues with crew sightlines and emergency egress down the aisle. A slight straightening of the curve was required from the initial proposal, but the design was soon approved. The curve wouldn’t work so well with a trolley service, but with Etihad’s restaurant-style tray service it works perfectly. The seat itself is bespoke, created by Acumen in collaboration with B/E Aerospace. With the seat pushed far back against the rear wall of the suite to maximize space, no existing seat mechanism was suitable for this design, so it really is all-new. The forward/aft configuration meant that a lot of ergonomic work went into getting the seat angles right so the seat is comfortable for passengers during take-off in either direction, and for a very broad percentile range of passenger heights and widths, with particular care taken to ensure that shorter passengers don’t have pressure on the backs of their knees and that their feet touch the floor. With Poltrona Frau leather upholstery in three different color schemes echoing those on the A380, an in-seat massage function, an Icebridge in-seat drinks chiller and a 24in IFE display, Etihad’s first suites are a truly luxurious experience. Even better, guests traveling together in the center suites can slide the divider forward to share the experience. The 28-seat business class cabin is a very similar proposition to that on the A380, with bespoke seats in a forward/aft 1-2-1 configuration. 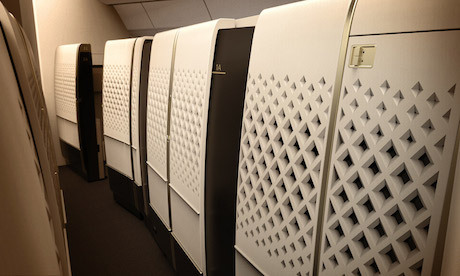 This product boasts 20% more space than the airline’s outgoing Solstys-based business class product, and offers a 22in-wide seat and separate ottoman with space for a carry-on underneath, which together create a fully-flat bed of up to 80.5in long (forward facing) and 75.7in (aft facing). Comfort is assured with Poltrona Frau leather, Lantal’s pneumatic cushion system for adjustable seat firmness, an in-seat massage function and an 18in IFE display. Again, a stowable screen between the center seats in this 1-2-1 configuration makes them ideal for passengers traveling together. A different result in the tender process meant that the B787 seats were developed with Zodiac Aerospace rather than Stelia Aerospace (the new name for EADS Sogerma), which manufactures the A380 equivalents. They may be manufactured by different companies, but passengers won’t be able to tell the difference between the seats – the dimensions of everything from seat width to the tray table are identical – but given the differences beneath the surface, this took a little work. 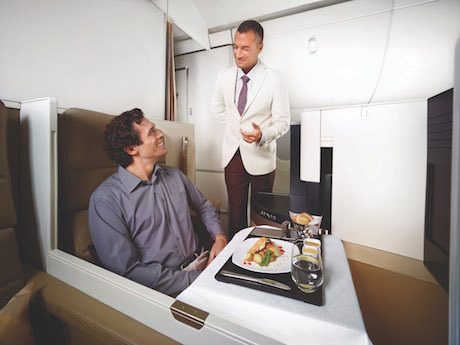 An element where Etihad had to stick to the catalog was the galley areas. However, the company did work with Jamco on some customization to create some visual similarity with the A380 units. 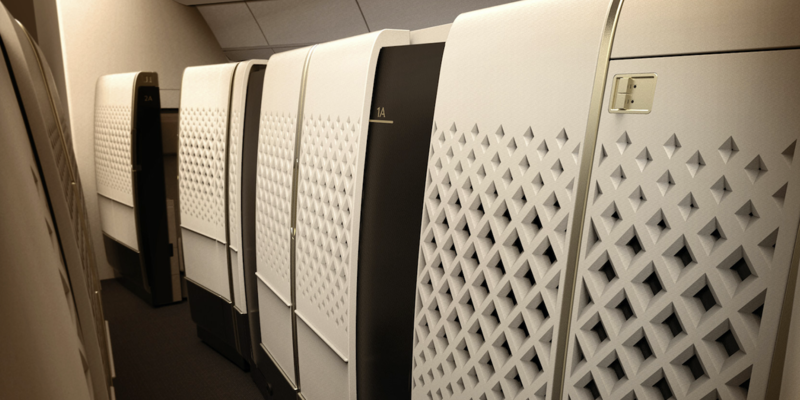 As James Tanner, an associate at Factorydesign, explains, “At the Door 2 entrance for business and economy passengers, the galley equipment is concealed by screens and blinds with Arabic fretwork detail like on the A380. We tried to keep in line with A380 as much as possible while being limited to the catalog.” The trolleys are clad in wood-finish veneers to complement the galley finishes. As with the A380 galleys, prayer areas by the exit doors are available for Muslim guests, which can be curtained off for privacy and are equipped with an electronic Qibla-finder showing the direction of Mecca. A clever feature that doesn’t cost the airline anything in terms of space, and little in terms of money. While Etihad acquiesced with the galleys, it was unimpressed with the catalog lavatory options, so the EDC again worked closely with Jamco, this time to achieve a high level of customization in the lavatories to ensure passengers enjoy the luxury brand experience throughout the aircraft. In the first class facilities everything above the bench is customized, including a mirrored cabinet in which lighting features and fretwork details have been incorporated, as well as customized faucets. Etihad’s Dreamliner is a remarkable project, which reflects the increasing needs and demands of airlines seeking to differentiate their product in a competitive market. We agree with Peter Baumgartner, who says that Boeing’s flexibility and support should be “appreciated and applauded”. Indeed Etihad has not just achieved a landmark Dreamliner design, it has also set a precedent for flexibility in the catalog approach that will benefit future customers. Even the 199 economy seats are customized, based on the Weber 5751 model from Zodiac Seats US. Passengers in these Economy Smart Seats get a 31-33in pitch, 6in recline, adjustable lumbar support, 11.1in IFE display, and a distinctive ‘fixed wing’ headrest upholstered in camel leather. The seat is the same as that found on the A380, but configured 3-3-3 rather than 3-4-3, and with a seat width of 17.2in rather than 18.95in to fit the narrower fuselage. For long-haul flights, Etihad has designed a pillow which, with a simple tug, converts from a standard pillow into a neck pillow. 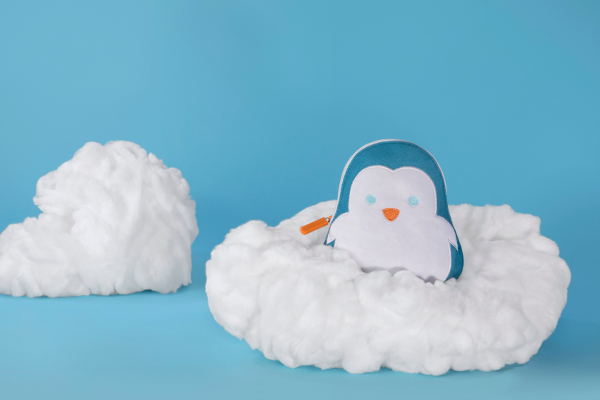 A cotton drawstring amenity kit is also provided, which includes a reversible eye-mask with ‘Do not disturb’ and ‘Wake me for meals’ printed on each side. Everyone is also given a blanket bag that doubles up as a ‘cabin tidy bag’, or a shoe bag. As well as the lighting issues with the Premium Ceiling, the EDC worked hard on creating the right lighting scenarios. Factorydesign’s Tanner explains, “We did a lot of work on human aspects. For example, the standard Boeing scenarios tend to fill the cabin with a lot of blue light, and our research suggests that blue light inhibits sleep. Thus we stripped blue light from all the scenarios except the waking scenario, so passengers feel refreshed when they leave the aircraft. Sadly the system that creates the ‘Lights of Abu Dhabi’ effect found on the A380 couldn’t be fitted to the B787. 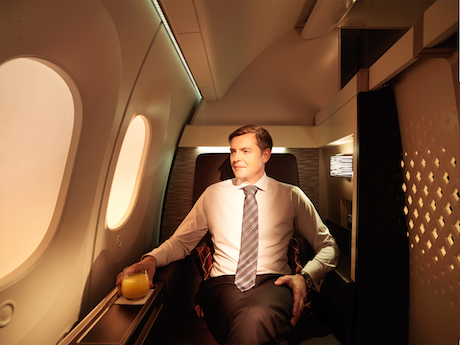 Etihad has also introduced new inflight products and enhancements to its long-haul cabins, across all classes. Inspired by luxury hotels, the first class service includes a personalized welcome letter from the cabin service manager. 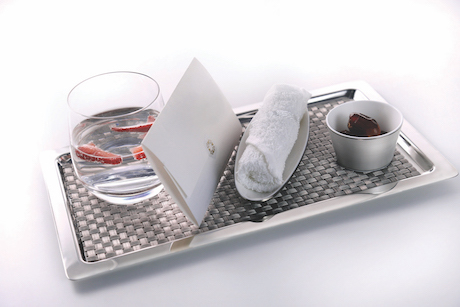 Once seated, guests are served with an elegant silver tray bearing a welcome drink, fragrant hot towel and Arabic dates. The tray fits on the armrest so the tray table does not need to be deployed. 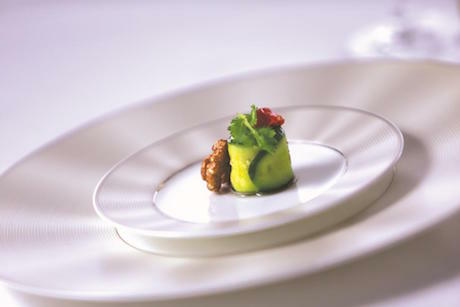 First class diners also enjoy a new gourmet menu served on Japanese fine bone china, accompanied by wines served in stemmed crystal glasses (pictured below). At bedtime, the turndown service includes all-natural bed linen, pillow mist, pulse point oil, and a ‘Sweet Dreams’ card. 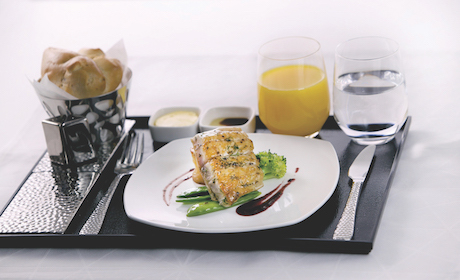 In business, the contemporary dining ware includes a stylized steel bread basket and a hammered metal side dish, inspired by the airline’s Facets of Abu Dhabi branding. A new business class turndown service is offered on ultra-long-haul flights, featuring a mattress, comforter, full-size pillow, loungewear and slippers.